Yesterday, I was in Orland Park and happened to see a Pace paratransit bus #14005 pulling into an assisted care living facility. I didn't get a pic of it, but are they now going the direction of the year/number way of numbering their buses and getting away from the 5000s? Maybe they ran out of 5000s (except they could have gone back to 5500). However, this numbering seems similar to the hybrid paratransit buses (11101). Maybe you caught onto a pattern. Those buses may be confined to the Orland Park area, I saw #14035 yesterday in the area also. Wonder if there is a garage for these buses somewhere in the South Suburbs? Maybe South Holland? All of the paratransit vehicles (except for River) are assigned either to contractors or to Dial-a-Ride projects (Pace page and subpages). Thus, the vehicles in question would be garaged either by the contractor for South Cook, or for the Village of Orland Park, Village of Orland Hills Dial-a-Ride (or maybe an adjoining village, such as Tinley Park or Palos Hills). *I knew it was there at one time, because when paratransit was turned over to Pace, Carole Brown had posted "at least CTA contracted it out, but Pace hadn't," to which I was able to provide a link that she didn't know what she was talking about. **You really have to zoom it. ***Which I know is First Transit on Johns Ct. in Glenview. I've even seen buses being backed up into the building. Correction: Pace owns the McHenry garage, but First Transit operates it. There is eventually going to be a similar garage in DuPage. How many 14000's are there? At least 35. Since they are green, are they hybrids? 14050 on 294 at 87th St SB today - standard white/blue paint. All of the 14000s I've seen so far have been the standard white/blue paint. I haven't seen them really close, but they appear to not be hybrids. The top of these vehicles are slightly different than the 5000s, probably different a/c setup. Solicitations were for diesels. The only indication of hybrids was the ARRA grant that IDOT received for hybrid buses for various transit authorities, including Pace. About a month ago there were about a dozen GREEN paratransit vans at South Holland. If those are not 14000's, what are they? I was looking for Axess buses, but didn't see anything in the yard. There were about 6 Orion VIs there (one under a tarp, which I would guess the one that was flame broiled at Palwaukee Plaza). Thus, the question is whether the Axess buses now at NW are because the 6 Orions were dead, or vice versa. 6655 and 6657 were also in the lot, indicating to me that S is starting to trash their 35 footers. Any indications how many 14000's there are going to be? Is PACE starting to get into the practice of replacing the entire paratransit fleet in one shot every five years? That's what their FTA lifetime is. Other than that, Pace never gives accurate public information about quantifies it is buying. However, we can't assume all are one shot, as the existing ones are a combination of a preexisting contract and the TIGER of 190. Although the lengths aren't correct (in that there are the 5700s, which are shorter), there are about 394, of which 145 have exceeded 5 years. Quick question. What do the numbers you cite in between the quantities and lengths indicate? Quicky cut and paste job on my part. Years based on VIN's. This list gives you a total of 386, plus 46 small buses, for a total of 432. Apparently a couple of 2009's have been retired. Regarding the 11101-11110: These are 2010's. If they were at PACE recently, they must have been retired! NOTE - seems I can't read my own handwriting any more. Corrected 2010's to read 5981-5999. Years based on VIN's. Note there IS a 5913! This list gives you a total of 466, plus 46 small buses, for a total of 512. Way off from PACE official totals?? 2009 might be off because of a couple of early retirements, but 2010 should not be off by 80?? Regarding the 1110-11110: These are 2010's. If they were at PACE recently, they must have been retired! So, what's your source if you are saying that Pace mispublished its budget? And where did 5900-5979 suddenly appear? Provide a link. And why did you ask here? 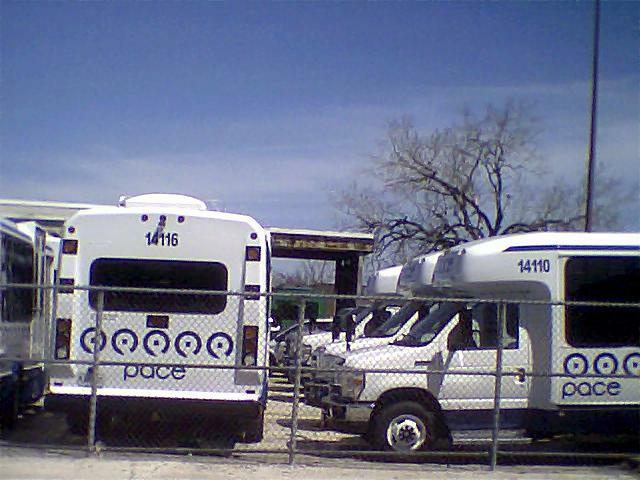 Stopped by Taft Lot today - new buses up to 14132 there. 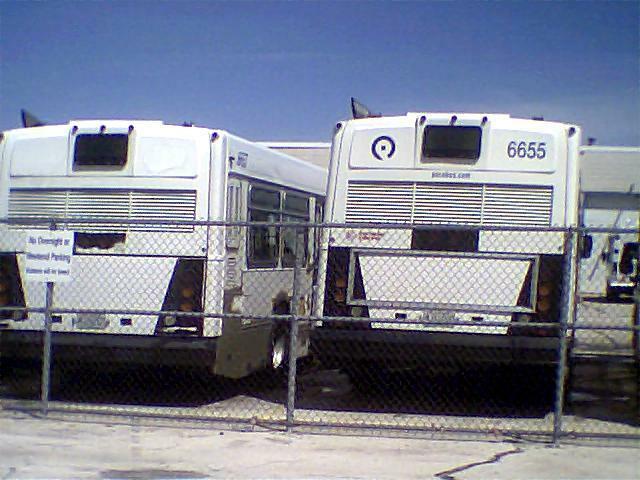 The 6600's appear to be getting ready to be repainted, most have decals removed and primered spots on them. First Transit (Glenview) has some 14000 series buses in Arlington Heights last week. Are they painted all grey. I've seen a lot in the north shore all grey with a 'bumper sticker' sized logo above the rear duals. Goes by too fast to catch a number. 14000 series are one window longer than old ones. Also AC on roof instead of below floor. Easy to spot. MV in Niles has new buses too, all white 4765 to at least 4803. The question would be whether Pace is now providing equipment for city contracts, as the operator for paratransit in the North Cook-South Lake area is First Transit in Glenview, or if this is really MV owned equipment.